As an amateur, James represented Wales & Great Britain at junior and youth level. He is very proud to have captained the Wales Boys team in 1986 and the Great Britain & Ireland Boys and Youth teams in 1986 & 1989 respectively. As part of these teams, he played alongside Darren Clarke, Andrew Coltart and Peter Baker who all went on to represent Europe in the Ryder Cup. Amongst his adversaries in these matches were players such as Thomas Levet, Peter Hedblom and Christian Cevaer, who all went on to win titles on the European Tour. James remembers fondly beating Thomas Levet and Christian Cevaer in his singles matches. He also represented Wales in two Home International matches held at Muirfield and Ganton. He also played alongside Ernie Els at the home of golf in the prestigious St.Andrews Links Trophy where he secured a top ten finish. Amongst his other notable achievements was a fourth place finish in the English Open Strokeplay Championship (Brabazon Trophy) at Burnham & Berrow in 1990. In his last event as an amateur, he represented Wales in the European Team Championships in Puerto De Hierro, Spain where he was unbeaten in his 6 matches. James first went to the European Tour Qualifying School in 1993 where he played all 6 rounds and secured his playing rights for the 1994 season. His best finish that year was 12th in the Bank Austria Open. The following year he played a full season on the European Challenge Tour winning the season’s opening event, the Kenya Open, shooting a tournament record of 19 under par and playing alongside Thomas Bjorn for the final two rounds. James achieved a number of other top ten finishes that year securing 18th place in the Challenge Tour Order Of Merit.. A highlight of the year was qualifying for the Gene Sarazen World Open in Atlanta playing alongside Miguel Angel Jimenez and finishing in the top 20. As a PGA Club Professional James has represented Wales a record 7 times in the PGA Of Europe Team Championship where he also captained his country to victory in 2009. He won the British Club Professional Championship held at Dundonald Links in Scotland in 2009 and later that year represented the Club Professionals of Great Britain & Ireland against their American counterparts at Loch Lomond where he secured two wins in four matches. In 2010 James played in the BMW PGA Championships at Wentworth where many of his friends, family and Club members went to support him. James still enjoys playing and in 2016 became the Foremost Professional Champion with a score of 67 (-5) at the Oxfordshire Golf Club. 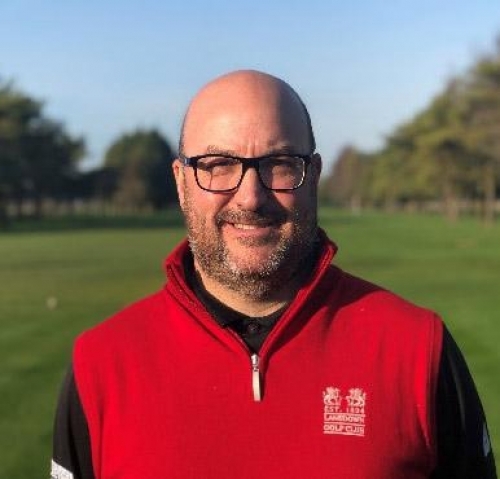 He has been heavily involved over the last ten years with PGA committees and has represented the PGA In England & Wales (West) as Captain in 2009 and Chairman 2013-2016, sitting on the PGA’s Executive Committee. In 2018 James was awarded PGA Fellow Membership of the Professional Golfers Association. This was for recognition of his achievements in tournament golf, his dedicated committee work and his involvement within the community during his time as a PGA Member. James is a member of the Foremost Golf Group (UK’s largest golf buying group) which enables him to supply quality merchandise at competitive prices. A click and collect service is available on the Foremost website which gives a huge selection of equipment delivered to the Pro Shop within 48 hours. He has also invested in a GC2 launch monitor and HMT technology to ensure members and visitors receive the best in modern technology for their custom fitting and coaching experience. James joined us in October 2016 from Caerphilly Golf Club in South Wales where he was Head Professional for 12 years. The Pro Shop team also consists of Assistant Professional Will Doust who has recently become the proud owner of a Trackman device to enable him to offer an excellent custom fit and coaching service and shop assistant Stuart Cowper who joined us from Cumberwell Park. For all your golfing needs please come and visit one of the team where a warm welcome and excellent customer service is guaranteed.